Play from 0.01 up to5.00 per line bet and wager up to 5 coins per payline. The maximum bet is 75 coins per spin. The Newspaper substitutes for all symbols except the Bonus symbol. Get 5 Wilds on any line with the maximum bet to win the top jackpot of 25 000 coins! The Newspaper Wild will not substitute for the Who Won It Bonus symbol and doesn’t activate the Who Won It Bonus Feature game. The Scatter symbols only appear on reels 1, 2, and 3. When 3 Scatters appear anywhere on an active payline the Bonus Feature will be activated. 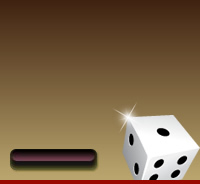 Land 3 Bonus symbols on any active payline to win a chance at the Bonus Round offer. Click the Start button to receive the 1st Bonus Round offer. A Magnifying Glass will move over all 3 Bonus boards: "Suspects", "Room", and "Weapon" which will reveal the Bonus award amounts. The amount will be written on a notepad which will be used to determine the Bonus Prize offer. 3 Bonus awards will be offered with the option to take the Bonus Prize offer by clicking the "Take Win" button, or the "Try Again" button. The next Bonus Prize offer could be higher or lower than the current one. By refusing the first "2 Bonus Prize" offers, you automatically get the final Bonus Prize offer amount as the Bonus Prize win. 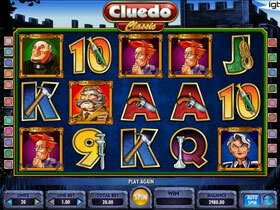 NB We could not find any online casino that still offers Cluedo Slot.